The front part of the house at 415 Boyd Mill Ave. is a direct replica of a home almost destroyed in July 2006 by crews renovating the house. Under the watchful eye of Bernie Butler of D9 Development, the home has been reconstructed and an addition added to create a home with a historic feel but modern amenities. Bernie Butler loves historic Franklin and has multiple projects under way — like theBrownstones at First and Church and plans on the drawing board for the first Class Aoffice space in downtown Franklin at 131 Third Avenue North. But one project which has occupied his time for more than a year started out as aproject to help a friend and has evolved into a life lesson for Butler. “I never wanted to do this house. This is a great lesson in sticking to your knitting,” saidButler of the house at 415 Boyd Mill Ave. He will open it for a community open houseon Jan. 19-20 and the 4,600-plus square foot home is currently on the market for $1.1 million. The project at 415 Boyd Mill started as rehab to help a friend who was a construction manager, said Bulter, who admits he’s not a remodeler. "There are a lot of great remodelers, like Skeeter Coleman and Michael Lee. And theyhave the patience for it," Butler said. "I never wanted to remodel a house in the historic district. The thing that I learned is that I am such a person who has to do it perfect. I can't do something half way. I really have to watch what kind of stuff I get involved in." In July 2006, crews working on the home told Butler there was rotten wood in the frontportion of the house and he told them it had to be removed. Out of town during the time, when he returned he found that just two walls and a series of floor joists in the original portion of the house remained. Under the watchful eye of the city's Historic Zoning Commission, Butler began to rebuild the house, assisted by master craftsman Michael Lee. Butler fortunately had made extensive photos of the house prior to the work which left just a shell, and used those photos to develop a new set of plans. Now more than a year later, the original home has been rebuilt, as well as an addition added to create a new home sitting on a historic site. For Shanon Peterson Wasielewski, the city's preservation planner, the end result meets the goal set by the city's Historic Zoning Commission. "The Historic Zoning Commission and staff worked very closely over the course of several months with the applicant to ensure that the original portion of the house that was demolished was accurately reconstructed based on documented photographic and physical evidence," she said. "This was done to ensure that, while the historic structure itself is largely gone, the front portion of the house continues tell the story of the house that was there and the addition is consistent with the overall character and rhythm of the larger Boyd Mill historic district." Mary Pearce, executive director of the Heritage Foundation and a member of the Historic Commission, said while she would rather have seen the original home restored, Butler has lived up to his promise of creating a structure that fits with the neighborhood. "As an advocate for the stewardship of our historic resources, I would have preferred the historic home be restored and enlarged rather than a whole new house built," she said. "However, Bernie Butler with D9 Construction has made every effort to recreate the old house that stood on this site and to add square footage in a way that looks like an addition that is sensitive to the historic architecture of the recreated old structure. 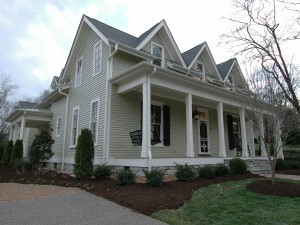 The setback and materials are in keeping with the historic Boyd Mill neighborhood." Butler himself is pleased, as well as a little relieved the process is over, except for finding a buyer. "I love creating new product that looks old," Butler said of his projects like the Brownstones. "I love taking non-contributing pieces of real estate, that are adding no value, and creating value that will last for hundreds of years." Photography has been a part of the whole process, Butler said, adding that new owners will be able to see every stage of construction and have a sense of the care that has been taken. "The execution, it is something that everybody is going to love and be happy with," said of the end product. The main house has four bedrooms, 4.5 baths, historically accurate molding treatments, eight-foot solid wood doors and a professional kitchen with Wolf and Subzero appliance, Butler said. Other features in the house include a large master suite downstairs with a private side porch and master bath that includes a Jacuzzi air bath and walk-in tile shower. There is a media/playroom upstairs with a half kitchen which includes granite countertops, sink, microwave and under-counter refrigerators with ice maker. Downstairs, a large dining room, office or music room can be found off the foyer. The home also includes a completely remodeled 800-square-foot guest house/studio. The guest house has separate utilities and a mailing address and can be leased, Butler said. With master bedrooms both upstairs and down, Butler believes the home will find a buyer. "I think it is meant for somebody," said Butler. "Obviously it is a million dollar house. It is for somebody who wants to live in historic Franklin, but doesn't want to live in a historic house." From the beginning, Butler took responsibility for the home’s restoration, feeling that he had a responsibility not only to the community but to the past. "I can't tell you how much effort went into this project from the city, from preservationists from everybody working together to make a bad situation good," Butler said. "Those guys have been very helpful to me in creating what is there. What they knew about me was I was going to do the right thing." A quick walk or drive through downtown Franklin shows Butler is committed to downtown and making it a livable, workable community. "I have this very symbiotic relationship, very careful relationship, with the preservation community because I feel I am a part of that," Butler said. "It is very important for us to do a good job of maintaining infrastructure of things that need to be here." During the next 30 days, four to six more families will close and move into their Brownstones. Also the courtyard and fountain should be finished within that time frame or soon after, adding beauty to the developing block between First and Second Avenues and bordered by Church Street. 415 Boyd Mill Ave. will be open Jan. 19 from 10 a.m. to 2 p.m. and Jan. 20 from 2-5 p.m. Donations will be accepted and all funds received will go toward the Franklin Cinema redevelopment. "The Heritage Foundation is delighted that D9 Development is allowing us to take donations and sell tickets at the open house to the premiere of the Jimmy Gentry documentary scheduled for Feb. 15 and 16 at the Fourth Avenue Church of Christ," Pearce said. - Article appears as published by the Wiliamson Herald.